When you think about it, guns have been a problem for despots ever since people switched from swords, spears and archery to gunpowder. They provide the common man with the means of self defense and a hedge against tyranny. This day in history marks the infamous "Gunpowder Incident". The incident and the conflict was created by guns, ammunition . . . and a British attempt to confiscate them. You see, while the ownership of firearms by the local colonists didn't cause any specific problem for the British, the effort to seize them inevitably did. Will progs draw any conclusions from this? They don't read history, they think that the climate is changing in a meaningful way - polar bears are now extinct, and if you dispute it, they'll run, hide in a locked closet, put on pajamas, stroke a stuffed toy animal and drink cocoa until you leave. Yes, I know. It's what they do. King George III had been limiting the inflow of guns and ammunition into the American colonies for months. His Governors were to “take the most Effectual Measures for Arresting, detaining and securing any Gunpowder or any sort of Arms or Ammunition,” unless a royal license could be produced. You already know that the shots at Lexington and Concord were sparked by British General Thomas Gage’s attempt to seize ammunition stores. But you may not know what was happening in Williamsburg that same week. Colonists there were patrolling their own town. 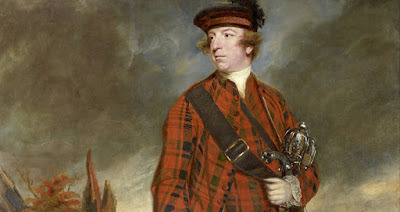 They’d heard a rumor that the Royal Governor, John Murray, 4th Earl of Dunmore, was preparing to seize their gunpowder. Dunmore secretly brought in 20 marines and sailors under the command of Lt. Henry Collins. When the citizens of Williamsburg began to relax their patrols, Collins would take advantage of the opportunity. He didn’t have to wait long. On the night of April 20-21, the guards who were watching the magazine left early. At about 3 a.m., Collins and his men quietly seized about 15 half-barrels of gunpowder, while Williamsburg was fast asleep. An alarm was raised, but it was too late. Yes, he looks like a jerk in the painting too. The magazine had been “erected at the public expence . . . for the protection and security of the country . . . in cases of invasions and insurrections.” Lord Dunmore had no right to seize the public’s gunpowder. But that's not how Dunmore saw it. Indeed, a mob might have assaulted Dunmore but for the intervention of Peyton Randolph, the speaker of the Virginia House of Burgesses. Randolph convinced the townspeople to seek a peaceful resolution. Dunmore was wily, though. He tried to use the people’s fears against them, making the (untruthful) argument that he’d seized the ammunition because he was worried about a slave uprising! He argued the gunpowder was more “secure” with him, but he promised to return it, if needed. Randolph was inclined to believe this falsehood. Patrick Henry was not. 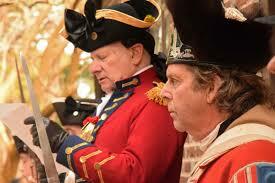 By May 3, Henry was outside Williamsburg and in command of a detachment of men from his home county of Hanover. He demanded the stolen gunpowder—or restitution for it. The people Williamsburg had learned of the “shot heard ‘round the world” at Lexington Green two weeks before. The next day, the colony’s receiver general gave Henry 330 pounds. Henry called off his men, but he was only temporarily appeased. He would soon leave to attend the Second Continental Congress. Dunmore hated being outdone by Henry. On May 6, he issued a proclamation denouncing “a certain Patrick Henry” and his “deluded Followers,” for unlawfully taking up arms and exciting rebellion.